For carpets up to 3/4"" thick including padding. All day support for everyday office use. Features AnchorBar? 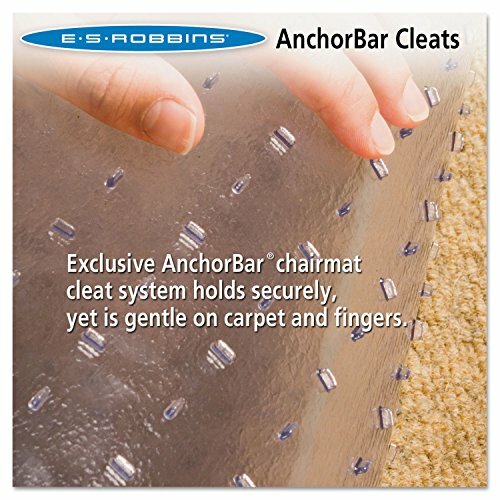 chair mat cleats that hold firmly in place, yet are gentle on carpet and fingers. Protects against wear and tear from chair casters. Contour design for L, U and Corner workstations. Protects medium pile carpets up to 3/4"" thick, including padding. Mat Type: Chair Mat; Application: Carpets; Material(s): Vinyl; Style: L-Workstation. Cleated chair mat for carpets. For carpets up to 3/4"" thick including padding. Features AnchorBar? chair mat cleats that hold firmly in place, yet are gentle on carpet and fingers. If you have any questions about this product by ES Robbins, contact us by completing and submitting the form below. If you are looking for a specif part number, please include it with your message.